Hello. Hey. Hi. Howdy. Yo. 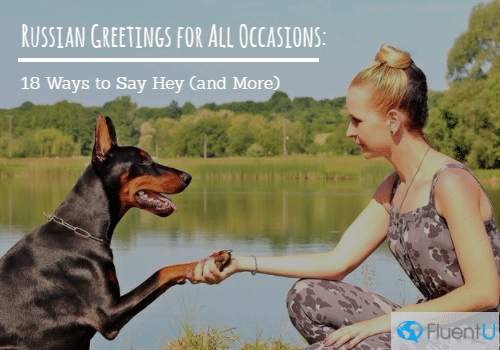 Using the right greeting can set the tone for an entire conversation. So it should come as no surprise that greetings are just as important in Russian. And Russian has plenty of different greetings to choose from. You can dip your toes into the most basic of greetings, and they’ll always get the job done. However, diving into the deep end with less common greetings will give you a much wider selection of options to meet all your needs. With good etiquette (check out eDiplomat’s guide to Russian etiquette), some cultural know-how and the perfect greeting, you’ll be well on your way to starting any conversation in grand style! Why Learn a Variety of Russian Greetings? Learning a variety of Russian greetings will equip you to start off any conversation on the right foot. Again, greetings set the tone for the conversation that follows, so knowing the right greeting is valuable. If you learn a variety of greetings, you’ll have the right phrase whether you’re ordering food, greeting a friend or entering into a very important business negotiation. Additionally, knowing a variety of Russian greetings will make you seem more knowledgeable. Plenty of tourists will have studied a few greetings, but few know a wide array, so having this information will set you apart from the pack. You don’t have to take advanced Russian lessons to sound in-the-know. All it takes is a little extra time and effort! Finally, Russian greetings are easy to incorporate into your everyday vocabulary. Since they’re so commonly used, they’re much easier to learn fast and start using immediately than lots of other phrases. Russian greetings are helpful when you’re speaking Russian, of course, but you don’t even have to restrict their use to your Russian-language conversations. You can also use them with English-speaking friends and family to add a little color to your vocabulary. Your friends and family will understand what you mean in no time, and this way you can use your Russian skills more often and spread your love of the Russian language to those around you! FluentU makes learning greetings and a variety of other everyday speech even easier. FluentU takes real-world videos—like movie trailers, music videos, news and inspiring talks—and turns them into personalized language lessons. The workhorse of Russian greetings, здравствуйте is the most common way to say hello. It may be a mouthful, but is definitely worth taking the time to learn. Здравствуйте is often used in the most formal situations. Additionally, if you’re speaking to a group, здравствуйте is also the preferred choice, since the verb form is meant to be used either in formal situations or when you’re speaking to more than one person. Здравствуй, on the other hand, is the informal version of the same word, which you can use with friends or with children. However, when in doubt about level of formality, always go with the formal здравствуйте. If здравствуйте is too much of a mouthful, you can also shorten it to здрасьте as long as the situation isn’t too formal. Interestingly enough, здравствуйте and здравствуй actually come from the verb здравствовать, which means “to be healthy” or “to live long.” Now that’s a warm welcome! Алло is also used to mean “hello.” However, this is most often used when answering the phone, and not often used in other contexts. Luckily for English speakers, this is a very easy Russian word to learn to remember and pronounce. Привет is a very common informal greeting. It’s used like the English word “hi.” Since it’s easy and common, you may find yourself using this one quite often. Приветик is the diminutive of привет, so it’s an even less formal way of saying “hi.” You might think of it as “hiya” or “howdy.” It’s most often used by women, so it may come across as feminine. That being said, it usually comes across as particularly sweet. If you hang out with young, hip Russians, you may hear some greetings that sound deceptively familiar. That’s because they’re Anglicisms, meaning they were derived from common English-language greetings. If you like a good Anglicism, you may even encounter a few more. Хей (“hey”), хай (“hi”) and йо (“yo”) are also pronounced quite similarly to their American counterparts. Здорово is an informal greeting that can be used like “hey.” It’s important to pay attention to context and the accent, though. When the stress is on the second о, this is a greeting. When the stress is on the first о, it can also mean “wow” or “well done,” so always pay attention to stress and context. It could certainly be awkward if someone is praising you and you respond with a greeting! Доброе утро is a formal greeting that literally means “good morning.” Not too surprisingly, you should try to restrict your use of this greeting to morning hours. Добрый день is a formal greeting that means “good day.” This can be used late morning through the afternoon. Добрый вечер is a formal greeting that means “good evening.” It’s used during evening hours but not during the night. Доброй ночи is a formal phrase meaning “good night.” You can use it as a greeting at night or in the early morning while it’s still dark out. You can also use it as a farewell. Beware: It’s important to note the difference between greetings and farewells, even if they sometimes overlap. Спокойной ночи is not actually a greeting even though it shares the same basic meaning as a phrase that can be used as a greeting. Like доброй ночи, спокойной ночи means “good night” (or more literally, “calm night”). However, while доброй ночи is often used as a greeting, спокойной ночи is used as a farewell before bed. Watch out for this wily trickster! This phrase offers a lot of options. The basic gist is “nice to see you.” However, variations are used to indicate your gender and to change the level of formality. Men would use рад, while women would say рада. If the situation is formal, you’d use вас, but you can also use тебя in informal situations. Как поживаете and как поживаешь mean “how are you doing?” Как поживаете is formal, while как поживаешь is informal. There are a few other ways to ask how someone is, but it’s important to note that no matter how someone asks, it’s usually not just an empty greeting; they most likely expect a response. Как дела? is used like “how’s it going?” The literal meaning is closer to “how are affairs?” If you want a similar but more formal phrase, you can also use как у вас дела? While used like “how’s it going,” this phrase more literally means “how’s life?” It’s informal. 17. Как делишки, как детишки? Как делишки, как детишки? is a Russian idiom. While it might not be the most common greeting on this list, it’s one of the most colorful. It literally means “How’s it going, how are the kids?” However, people may ask you this even if you don’t have kids. But why would someone ask about your kids if you don’t have them, you ask? Probably mostly because of the fun rhyme, which really rolls off the tongue. Needless to say, this greeting is informal, but man, is it fun. Что нового? means “what’s new?” It’s commonly used between friends, so have your favorite gossip handy in case someone asks you! With these 18 greetings, you’ll always have the perfect way to start a conversation! Study Russian the Smart, Fun Way: With Fables!